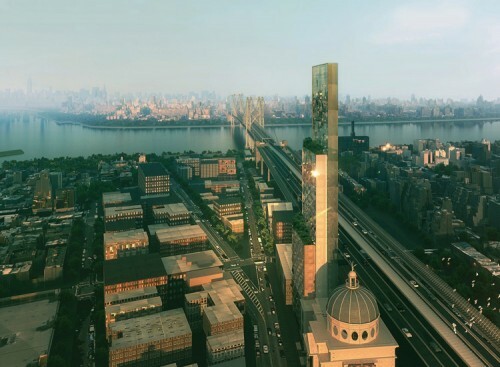 The Architects Newspaper has the winning renderings from an “international design competition” for a hotel on the parking lot to the west of the landmarked Williamsburgh Savings Bank, which look pretty amazing in a 40-story sort of way. Brownstoner wonders how theoretical this project is, and the answer is probably “extremely”. The developer is not named , nor are the other competition entrants (the design is from Oppenheim A + D [warning: Flash site]). It is not clear if this is requires zoning waivers, or if the project is using development rights (and waivers) from the landmark bank next door. Etc. Etc. Still – pretty pictures (pigeons and all) to contemplate.